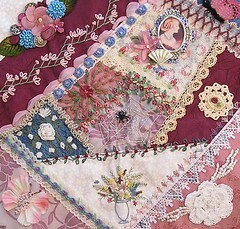 I just sent off my blocks for a new dyb round robin. This one is a faces rr and will be great fun to see what everyone conjure up as their interpretation of a face. 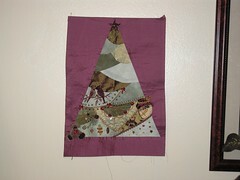 The theme as it were, of mine is Sugar Plum(p) Fairies ... you know....Nutcracker Suite? I sent these little faces along for folks to use (they are unfinished so they can paint em or emboss em, etc.) IF they want to. Please don't laugh at my pitiful attempt at maching piecing the blocks! Sheesh! Perfect example of why I hand piece! LOL!! Sigh...hopefully the ladies can see past that and they come home looking like Christmas! VBG! 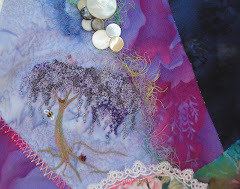 I've made myself stop stitching and filling so others will have room to play! VBG! This has been lots of fun and I enjoyed my time spent! I have some close up pics in my flickr album, if you click on the pic it should take you there! Enjoy! 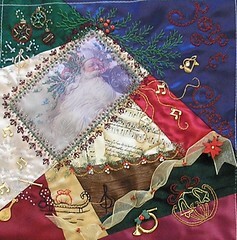 I've finished up my angel duties for the rr with Marya's block. I have added about fifty hearts to what was already in place! Lots of beading and fun! 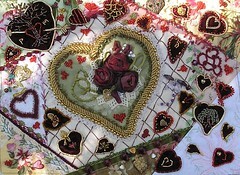 I appliqued a lot of velvet burgundy hearts to the block and completed them with cording, beading, etc. If you click on the picture, it ought to take you to my Flickr account where there are some close ups! Enjoy! 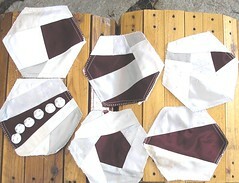 I've been meaning to show these completed blocks for the 2009 Artbra block. This is one and if you click on this pic, it will take you to my Flickr account where you can see the other! 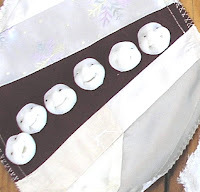 One of my "jobs" at CQI is to ocassionally do "Angel" stitching! I recently received two blocks to finish up for the hearts round robin. One of them is Dimity's (aka Diane). 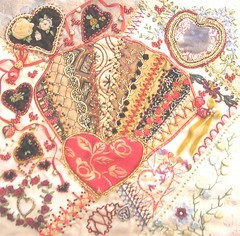 I've added 41 hearts to this gem and almost all of the work on the left hand side of the block is mine. The velvet hearts are not black, they are deep burgundy; I just couldn't get the colors to pop correctly. :( Twas fun playing here. I finished up the fan blades and seams, and dyed the lace along with beading, etc to try and bring the block together as a whole. Twas a challenge, but overall it pulled together! Enjoy Dimity! This Amy's block from the Beautiful Beginnings rr at CQI Novice. I am the last one to visit with the block and had to tie some elements togehter. I created a little butterfly out of some flower petals, added a nice arrangement in the white/beige block, added some sre roses on the blue patch to tone it down and a bullion flower in the mauve patch. 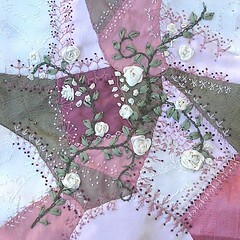 I also added bullion roses and some pink organza ribbon along a long seam to help tie it all together. I also added lace on the bottom left and added some seam work in a nice variegated thread to complement the colors in the block! I sure hope you enjoy the block, Amy! OH!! I also added a beaded necklace for your silkie! VBG! I am in Christmas rr, which is a lot of fun! I've just finished up my friend, Debbie's block. I LOVE this santa silkie! Sooo kewl! I have music pulling the sleigh, kicking off musical snow, a musical snowflace, ornies, bells, etc. Great, great fun! I hope that debbie enjoys it!